The Supreme Court on Thursday struck down as unconstitutional, 158-year-old Section 497 of the Indian Penal Code, which criminalizes adultery. 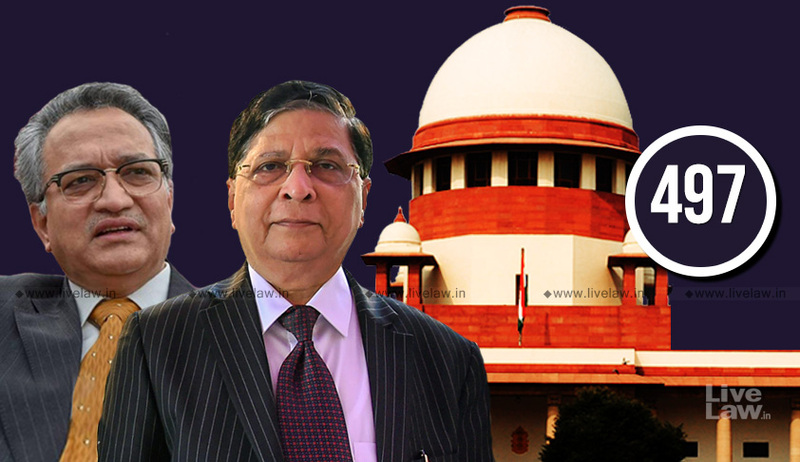 The five-Judge Bench comprising Chief Justice of India Dipak Misra and Justices R F Nariman, AM Khanwilkar, DY Chandrachud, and Indu Malhotra also declared as unconstitutional Section 198 of the Criminal Procedure Code, which deals with the procedure for filing a complaint for the offence of adultery. Besides, the court also overruled the decisions in Sowmithri Vishnu v. Union of India and another and V. Revathi v. Union of India and others, and any other judgment following these precedents. Examining the provision in the light of these ideals, he then highlighted the contrast that exists in the societal beliefs existing now and those which are being portrayed through the decades-old provision. “On a reading of the provision, it is demonstrable that women are treated as subordinate to men inasmuch as it lays down that when there is connivance or consent of the man, there is no offence. This treats the woman as a chattel. It treats her as the property of man and totally subservient to the will of the master. It is a reflection of the social dominance that was prevalent when the penal provision was drafted,” he explained. The CJI pointed out that the definition of “person aggrieved” under Section 198 CrPC, which treats the husband of the woman as deemed to be aggrieved by an offence committed under Section 497 IPC and in the absence of husband, some person who had care of the woman on his behalf at the time when such offence was committed with the leave of the court. The provision does not consider the wife of the adulterer as an aggrieved person. The definition, it then ruled, was “absolutely and manifestly arbitrary”, opining that it confers a licence on the husband to deal with the wife as he likes. It pointed out that while the provision does not treat a woman as an abettor but protects her, it does not enable the wife to file any criminal prosecution against the husband. Examining the impugned provision, the court then opined that the provision effectively creates a dent in the individual dignity of women, and hence violates Article 21 of the Constitution of India. This is especially because the provision exempts women from punishment for adultery, making it a patriarchal baggage which treats women as ‘chattel’ having no agency. The provision also exempts sexual acts with the wife of another man, if they are performed with the consent or connivance of that man—an exemption clearly an affront to personal dignity. “…the Court, with the passage of time, has recognized the conceptual equality of woman and the essential dignity which a woman is entitled to have. There can be no curtailment of the same. But, Section 497 IPC effectively does the same by creating invidious distinctions based on gender stereotypes which creates a dent in the individual dignity of women. Besides, the emphasis on the element of connivance or consent of the husband tantamounts to the subordination of women. Therefore, we have no hesitation in holding that the same offends Article 21 of the Constitution,” the court explained. The CJI also elaborated on how adultery is different from an offence committed under Section 498-A or any violation of the Protection of Women from Domestic Violence Act, 2005 or, the protection conceived of under Section 125 of the Code of Criminal Procedure or Sections 306 or 304B or 494 IPC. Besides, he opined that treating it as a criminal offence violates two facets of Article 21 of the Constitution, namely, dignity of husband and wife, as the case may be, and the privacy attached to a relationship between the two. The other offences, it says, do not enter into the private realm of a matrimonial relationship. The court took note of the fact that in case of adultery, the law expects the parties to remain loyal and maintain fidelity throughout. This expectation by law, it opined, is a command which gets into the core of privacy. It further asserted that when the parties to a marriage lose their moral commitment of the relationship and it creates a dent in the marriage, it will and should depend upon the parties as to how they deal with the situation. This, it said, is “a matter of privacy at its pinnacle”. Besides, the court also highlighted the manifest arbitrariness in the law, explaining, “Adultery, in certain situations, may not be the cause of an unhappy marriage. It can be the result. It is difficult to conceive of such situations in absolute terms. The issue that requires to be determined is whether the said “act” should be made a criminal offence especially when on certain occasions, it can be the cause and in certain situations, it can be the result. Additionally, the court looked into the jurisprudence in England, noting that it has never regarded adultery as a crime except for a period of ten years in the reign of Puritanical Oliver Cromwell. Further, noting that most countries have abolished criminalisation of adultery, it then opined that India should take the same path. The court, therefore, declared the impugned provisions unconstitutional.